Once your baby is readily moving about, you'll want to make a few changes in the nursery to accommodate your toddler's many interests. While some parents choose to redecorate the entire room, most find that with a few simple changes, you can turn the nursery into a wonderful area for your little one to sleep and play. You'll need to give the nursery a quick looking over to see what things your baby has outgrown. These items will need to be dismantled and sold, donated, or safely stored, depending on your future plans. Once you have cleared some space, it is time to replace those baby items with some nursery furniture that's more useful for your active toddler. Toddlers are very often excited about switching to a "big kid" bed, so most will not complain about the removal of the cot. Some cots are designed to be converted into a toddler bed, which can save considerable expense. If yours doesn't convert, you will need to purchase a single bed, but if you purchased full sized, rather than baby dressers, at least you won't need to buy a whole new bedroom set. In the beginning, your baby merely slept in the nursery or sat with you in the rocking chair. Now however, your boisterous toddler is all about action, so the nursery needs to be a playroom, as well as a bedroom. 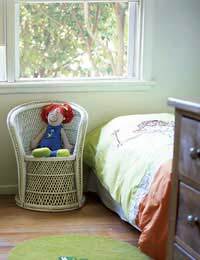 Among nursery furniture, toy bins on the floor work well and help to keep your little one's belongings organised. By now, you have most likely accumulated a nice selection of children's books, so a sturdy bookshelf is a good idea for nursery furniture. It's wise to have two levels of shelves and bins if possible. This gives you the ability to store books that are easily torn and items that require adult supervision (think messy items like paints, clay and craft supplies) to be kept out of reach, while giving toddlers access to their everyday toys and board books. Toddlers are quickly developing preferences on everything from breakfast foods to television shows and the decor in their rooms should reflect their individuality, if possible. While it is probably not practical to completely redecorate, adding a few touches can help to make the nursery less "babyish" and make your toddler feel comfortable. Sometimes, all it takes to transform the room is a new bedspread and curtains featuring a favourite storybook or television character. If you are planning to include a few new items of nursery furniture, you may want to take your little one shopping to see what is most appealing. We've found a great range at Great Little Trading Co. Along with their growing curiosities, toddlers are developing increased physical agility too. For this reason, it is important to be sure that nursery furniture like large bookshelves and dressers are securely attached to the wall. Toddlers are climbers and many parents will attest to the fact that their toddlers are very creative in finding ways to scale everything they encounter in the nursery. Shops that sell baby furniture should be able to advise you as to which products work best to keep furniture from tipping over, which can pose serious risks to young children. When moving your toddler out of the cot and into a traditional bed, many parents worry that the child will fall out of bed. One idea is to make the transition into the bed gradually, beginning with a mattress on the floor. This allows the child to get used to sleeping uncontained, but without worry of a fall. Once they are accustomed to the new mattress, it can be placed onto its frame, usually with a side guard in place. In time, the guard rail can be removed.